The Windows Vista OEM Certificate Auto Installer can automatically insert and install the selected manufacturer’s or brand’s OEM certificate (commonly known as digital cert or .xrm-ms XrML Digital License) used for Windows Vista OEM activation, which allows branded computer owner with necessary SLIC table embedded on BIOS to achieve instant activation without contacting Microsoft online or by phone. Who want to clean clean Windows Vista from fresh without the crap from manufacturer by not using OEM Recovery CD. You purchase your computer quite some time back, and only has Windows Vista RTM (6000.16386) version of installation CD. You download Windows Vista with SP1 integration DVD (6001.18000), and want to install directly Windows Vista SP1. 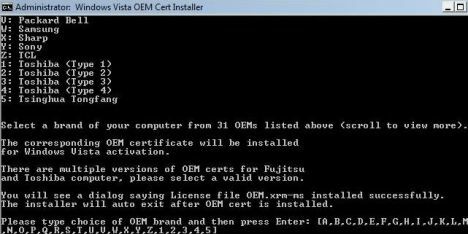 You modify your BIOS to include necessary Windows Market code bit (SLIC table) of one of the OEM brand supported, and now need to install or insert the necessary OEM certification into Windows Vista system as your system is not installed with a OEM version of Windows Vista DVD. This is not a Windows Vista activation crack. It merely input OEM certification using Microsoft officially provided function (slmgr.vbs). Thus, it does not automatically activate Windows Vista. Only useful for owners of OEM branded laptop or desktop computer with factory preinstalled Windows Vista (thus having SLIC table), or those who had hardmod their BIOS to include SLIC table. Require and only useful if you manage, or know how to backup or find the OEM SLP (System Lock Pre-installation) product key (so called royalty product key) where the single product key (for each edition) used by OEM on each and every factory pre-installed Windows Vista system. If you want to enter the OEM COA product key that printed on a sticker pasted on computer, the OEM cert is not needed as activation has to be done online or through phone. Convenient and easy to use. No need to remember any command or searching for .xrm-ms XrML digital license. Do not cause any harm, do not install any crap, and do not leave behind any rubbish (except the 31 .xrm-ms digital certs. Contains almost-most-complete 31 OEM brands’ XrML digital certificate. Full list of OEM brands supported: Acer, ASUS, BenQ, Compaq, Dell, eMachines, Founder, Fujitsu (2 types), Gateway, Gigabyte, Haier, Hasee, HEDY, HP, IBM, Lenovo, LG, MEDION, MSI, NEC, Packard Bell, Samsung, Sharp, Sony, TCL, Toshiba (4 types), and Tsinghua Tongfang . If your system don’t manage to activate automatically after inserting the correct digital license cert, try to check and change to a valid OEM SLP type product key.